Optionally can include Amazon Alexa in the U.S.
Acer has been surprising us for years with small-sized, high resolution bright projectors that don’t cost very much, and the V6810 is no exception. The latest from Acer America is a compact 4K UHD projector for home cinema can display up to 120-inch 4K UHD (3,840 × 2,160) with plenty of brightness—2,200 lumens to be exact ~642 Nits*. You need that level of brightness to comply with the HDR logo requirements, which means this little 13.5 × 10.2 × 4.9-inch, light weight (8.8 lbs.) projector is Rec.2020 and Rec.709 compatible and can show real HDR if you have some content with that quality of color depth. The on-screen menus (OSD) offer adjustment of everything you could think of including flipping the image in four positions (to accommodate mounting on ceilings, front and rear projection) and trapezoidal adjustments. There is also brightness and resolution sharpness control. Our setup consists of a PS4 as the source (WiFi, BDVD, games), feeding a Sony DN-SDR1030 AV 7.1 channel amp, driving the projector (via HDMI). In our setup we use a 120-inch Da-lite Cosmopolitan high gain screen and even with room lights on the images were bright and visible. 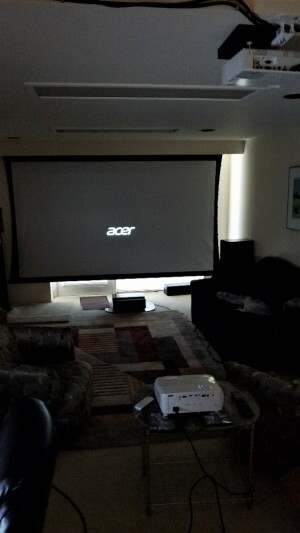 The projector is clearly targeted at the home theater user but could easily be at home in a conference or class room. The V6810 operates at an extremely low noise level of 21 dBA (in its silent mode), so movie aficionados can hear even the quietest whispers. Not really a problem in our lab with it’s 7.1 you need to wear ear plugs in our over amped environment—we’re gamers and like to hear the sounds. Using an optional wireless adapter, the Acer V6810 can access Internet and Cloud storage as well as project content, including games, photos, documents, movies, and videos from smart devices. There is also a wifi adaptor that lets you use Alexa with the projector so you could say, Alexa, get a Star Wars movie for me. The Acer V6810 and the Acer V6820i are available at online retailers for $1,399.99 (MSRP) and $1,499.99 (MSRP), respectively. Both come with a limited one-year parts and labor warranty. It also includes a long lifespan of up to 15,000 hours in Extreme ECO mode. This little projector (V6810) is amazing. For comparison, we have an Acer HD projector (H6502BD 1080P 3D DLP) and a $5,000 Dell (S718QL) 4K and the V6820 holds its own. The Dell is an incredibly bright, short-throw laser projector and the gold standard (for us at least) in projectors. The Acer projectors are DLP lamp-based color-wheel projectors. That type of optics engine limits the size of the lamp that can be used and therefore the upper-limit of the brightness. But, as mentioned, it’s not a problem, both Acer projectors are plenty bright. 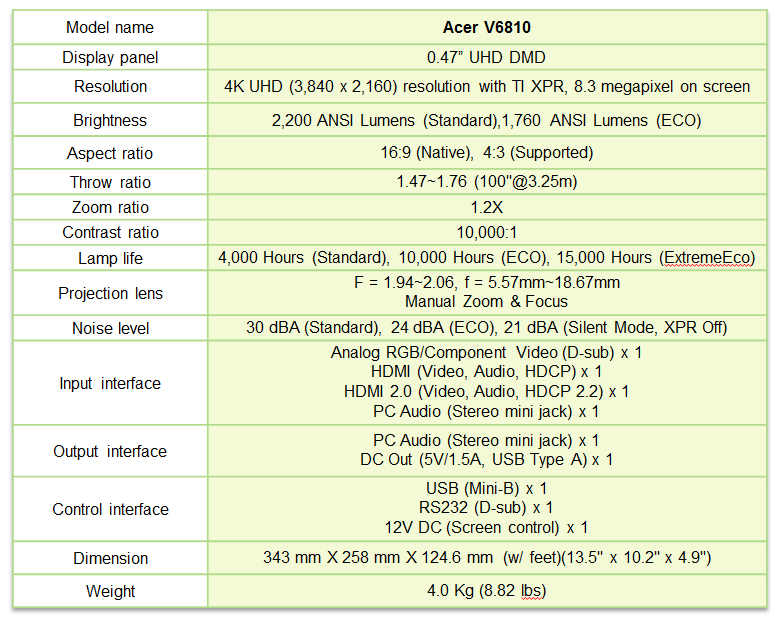 The V6810 is the least bright of the lot and has the smallest contrast ratio; however, Acer has a trick to compensate for that—DynamicBlack. In short, Acer’s DynamicBlack technology dynamically adjusts image contrast by analyzing on-screen content and adjusting lamp power to optimize black levels. The result (says the company) is blacker blacks and whiter whites. It is designed to enable satisfactory light levels for dark scenes, a challenge for projectors. The Acer V6810 can read and translate Rec.2020 language into Rec.709, the HD TV standard film directors adopted to digitally define the color identity during post-production. Thanks to meeting this standard, it can reproduce the original colors and tones the film director intended, resulting in an authentic movie-viewing experience. Projecting to a high gain screen with the projector near eye level on a table gives too much refection back to the viewer if you sit near the projector. An overhead projector, or a short-throw floor mounted projector produces a better result due the subtended arc angle. Another problem with a high-gain screen is it can’t produce the desired black level. HDR presents a new set of issues for older equipment and we are probably going to have to invest in a new black on black screen now that HDR is really here and affordable. Acer V6810 on table, Acer HD celling mounted, Dell short throw near screen on floor—which one is projecting? The optics of the V6820 are not as wide as we would like (f1.94 to 2.06) so to fill our 120-inch screen the projector has to be about 200-inches from the screen. That’s not a serious problem since any room able to support a big screen should be deep enough to position the projector. It is truly quiet. I sat two-feet to the right of it and watched a movie and TV and was not aware of the fan at all, and I’m hyper sensitive to such noises. I was aware of the heat however and had to put a baffle between me and the projector to redirect it. The exhaust on a projector is never where you want it due to the multiple mounting options. In conclusion, the V6810 is well a designed and cost-effective projector for home (and elsewhere). It can provide a giant 4K HDR display for much less money than an equivalent sized TV. When we were setting up the projector the boot-up splash screen lit up, showing the Acer name. After the projector senses the input signal the splash screen goes away—or at least it’s supposed to. The splash screen persisted even while the content was playing. We tried everything to get it to turn off, and finally out of desperation yanked the power cord out of it—and the splash screen still showed. WHAT!? It was then we realized the overhead Acer we have was waking up when we pressed the remote’s power button. And since the overhead wasn’t getting any input, its splash screen stayed on. Obviously, the travails of reviews bring up the sorts of problems that don’t happen to other people, but they can be instructive. IR codes are (pretty much) standardized, if they weren’t you could never have a universal RC. So, one could take their Acer RC and just have all kinds of prank fun in conference rooms. With this information and three dollars you can get a cup of coffee at Starbucks. *When comparing Nits to Lumens, in simple terms, 1 Nit represents more light than 1 ANSI lumen. The mathematical difference between Nits and Lumens is complex. However, for the consumer comparing a TV with a video projector, 1 Nit is the approximate equivalent of 3.426 ANSI Lumens.